This interesting Beck cover is missing a color. 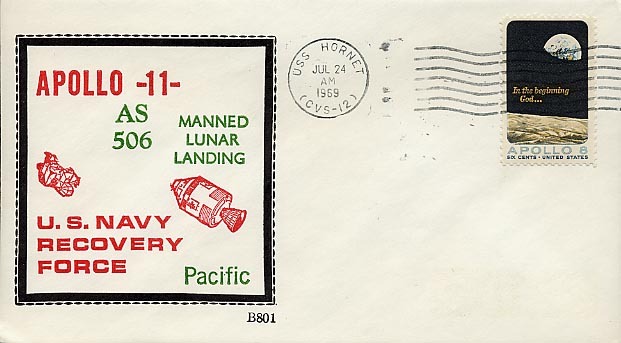 Note that the B896 number would have been printed in the missing RED color. Click HERE to see correctly printed cachet and view B896 listing. 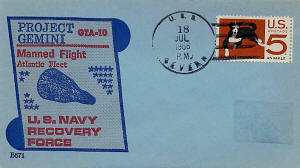 This Beck CREW cover sold on eBay this week for an amazing price of $135.50 after 13 bids. 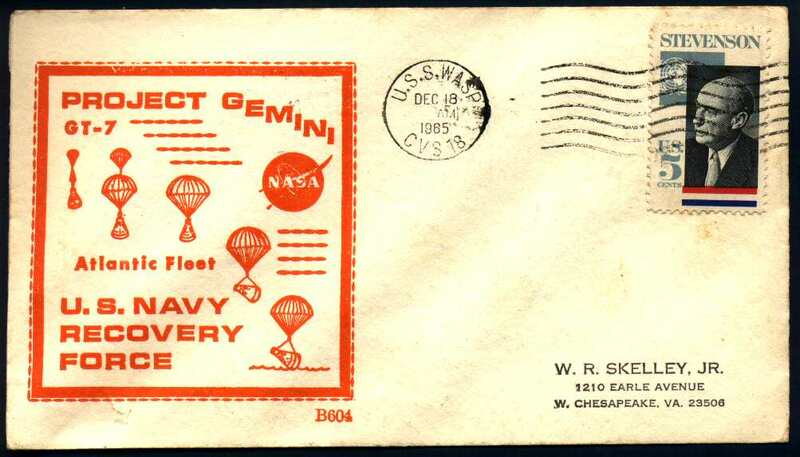 The envelope stuffer card was what made this cover so desirable. We have never seen this stuffer card produced by Mr. Beck. 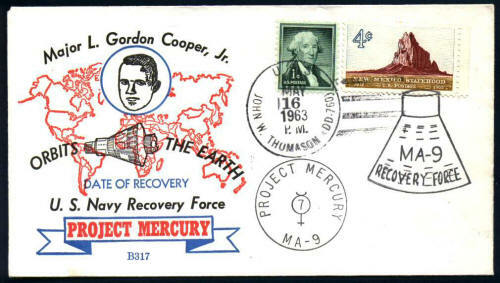 We have no idea how many he made of this item or any similar covers. 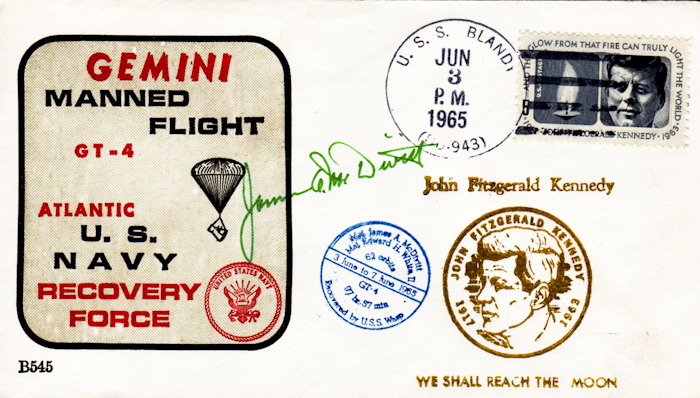 It is just a very interesting collectible and it fetched a nice price. 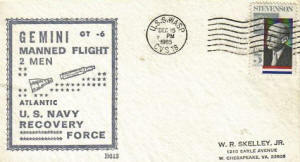 These are the first Beck cachets we have seen printed on the larger European sized envelope, referred to as C6 size. 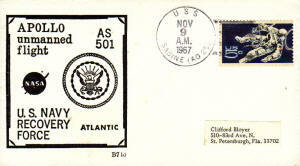 The C6 envelope size is the standard in Europe for most collector's covers while the 6 3/4 size envelope is common in North America. This PRS Beck cover was spotted on eBay. 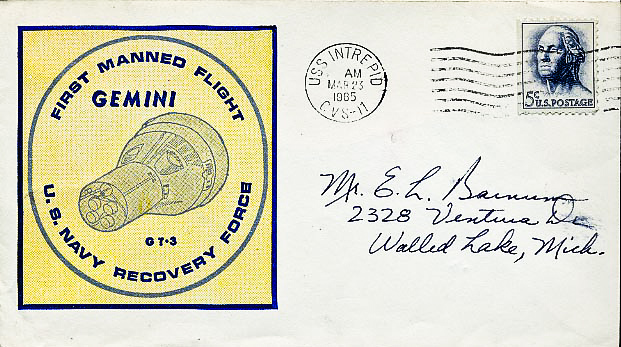 It is great to see that important covers like this one are holding their value for collectors. 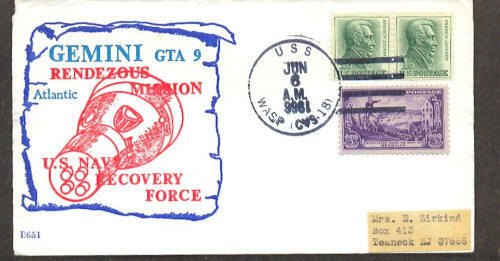 This previously unlisted cover was spotted on eBay. 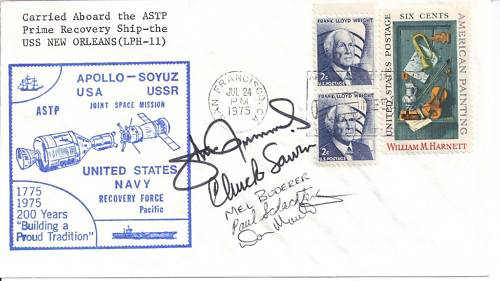 Scan courtesy of Dr. Ross J Smith Perhaps The "purchase" of Year! 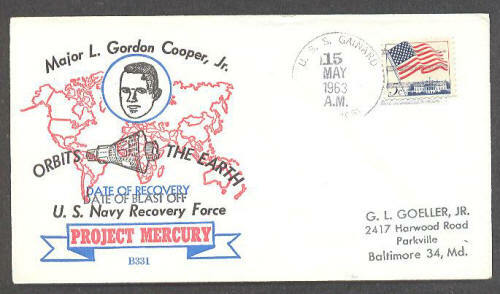 This previously unlisted/unknown CREW cover (B319) for Gordon's Mercury flight was bought on eBay. Dr. Smith "snagged" this cover for only $25. It was likely overlooked by many other Beck collectors that would have paid two or three times that amount. 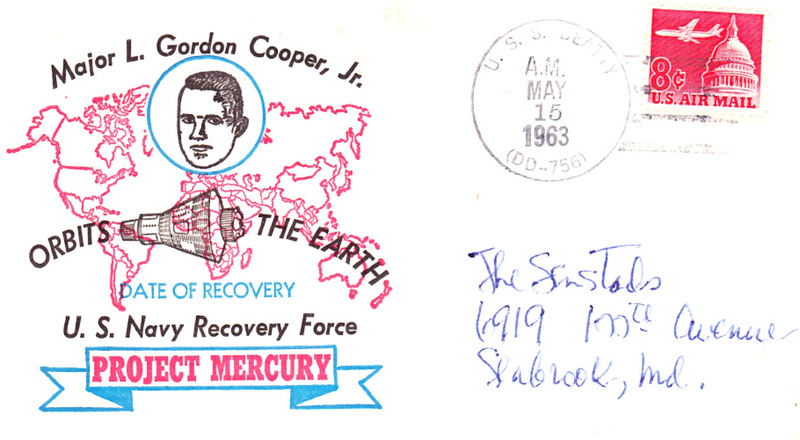 Note that the address on the cover is Mr. Beck's home address at that time. 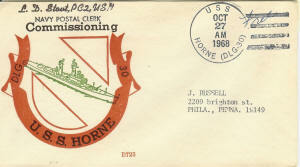 The scans at left were sent to us by Timothy Preston. 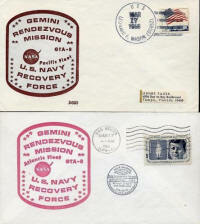 He found these two very elusive covers in a lot of covers purchased this year. 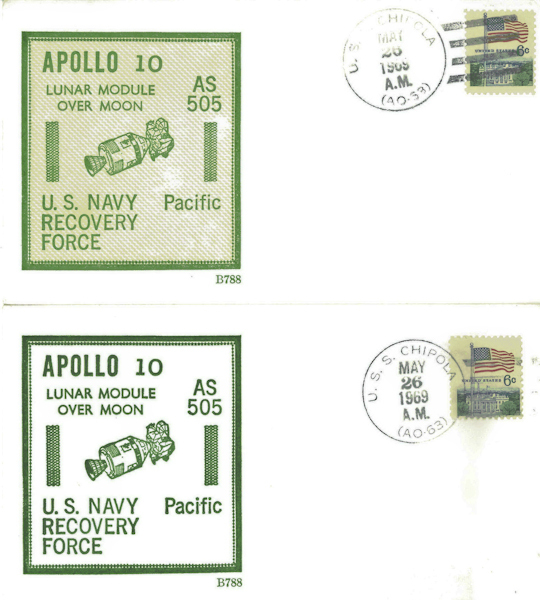 Take a look at the cover listings for these covers to view a similar looking cover of each. Up until now, we had only seen one example of each. This cover was sold on eBay for about $10. 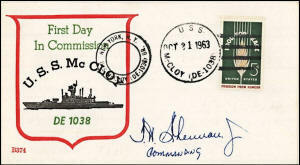 It has the autograph of the CO. A very nice cover. Bidding for a 1946 Morris W Beck cover postmarked on USS Douglas H Fox with a Navy Day 1946 cachet reached over $25 on eBay. Someone really wanted this cover! Typically, we haven't seen much bidding going on during the hot summer months. 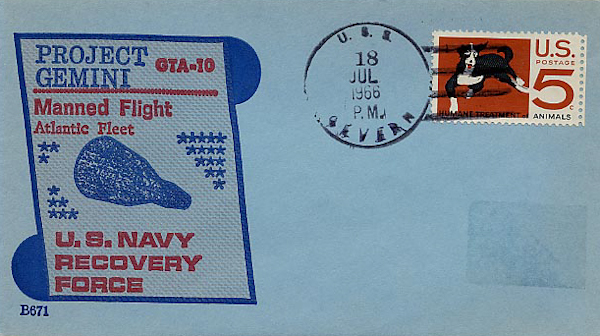 Check the cancels of the USS Wasp GTA-9 covers in your collection to see if you have one of the "RARE" cancel variety versions. 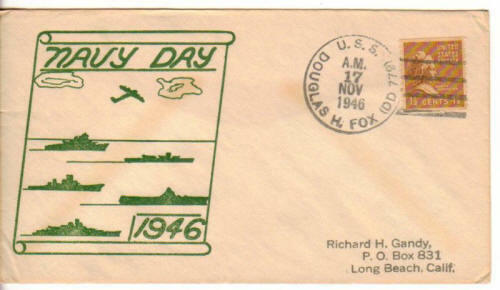 The variety is the upside down 1966 in the cancel slug. The scans at left show the only 3 covers we have observed. 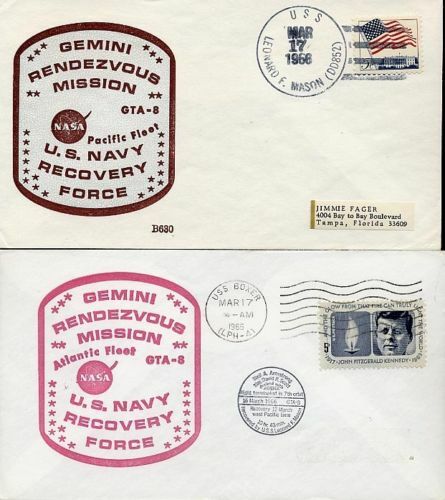 It is interesting to note that one cover has the US Navy rubber stamp cachet and the other two have the printed MW Beck cachets he assigned to the Wasp, B651, B657. 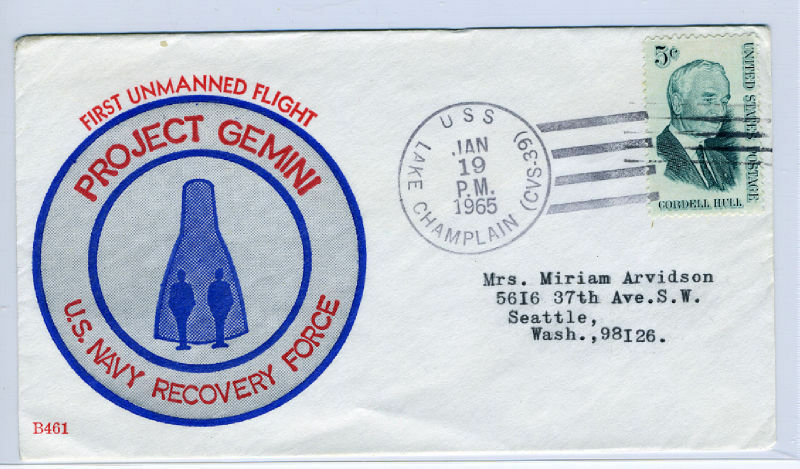 There must be similar covers out there in collections but they haven't surfaced yet. If you have one, please send us a scan. 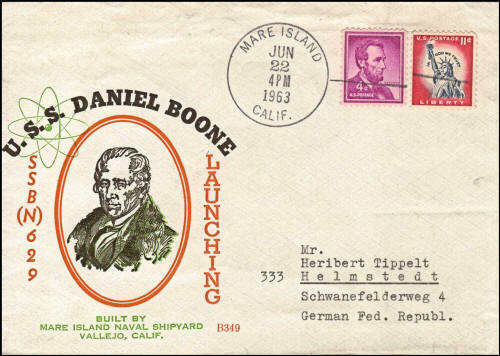 The rubber stamp cachet with the cancel variety/error recently sold for $61 at auction. The Beck printed cachets should sell for more and we estimate that they would sell for $75-100 each depending upon the situation. 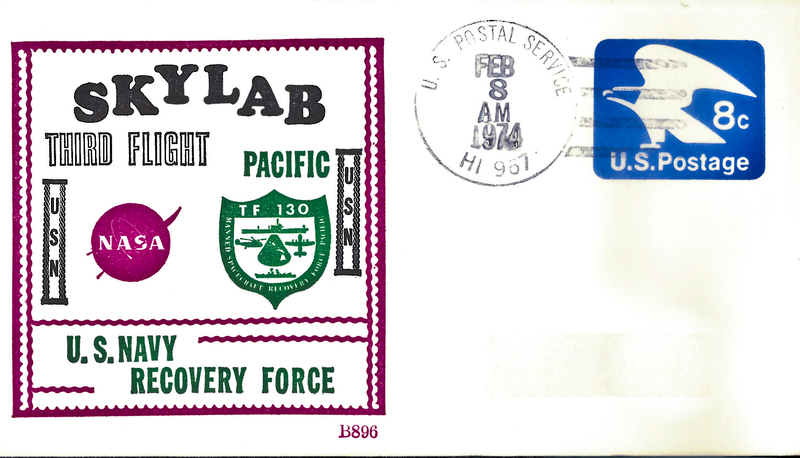 You might run across the cover with the cancel variety at a local stamp show but you are more likely to see the cover on eBay. 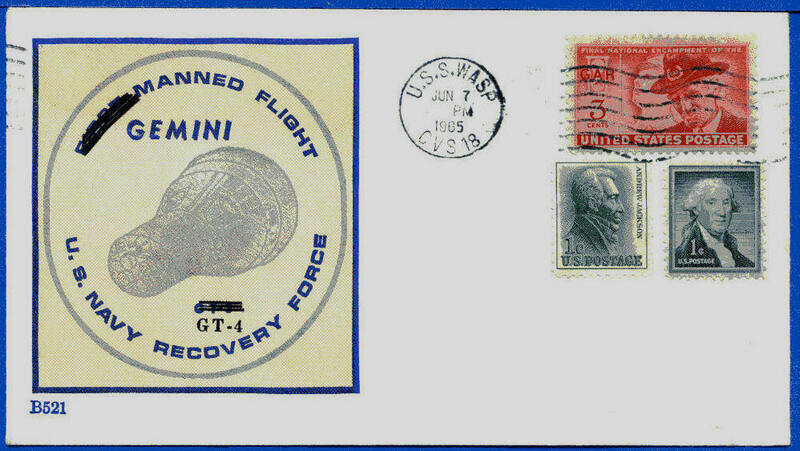 Depending upon how many collectors notice the cover the price would easily sell in the range stated above. 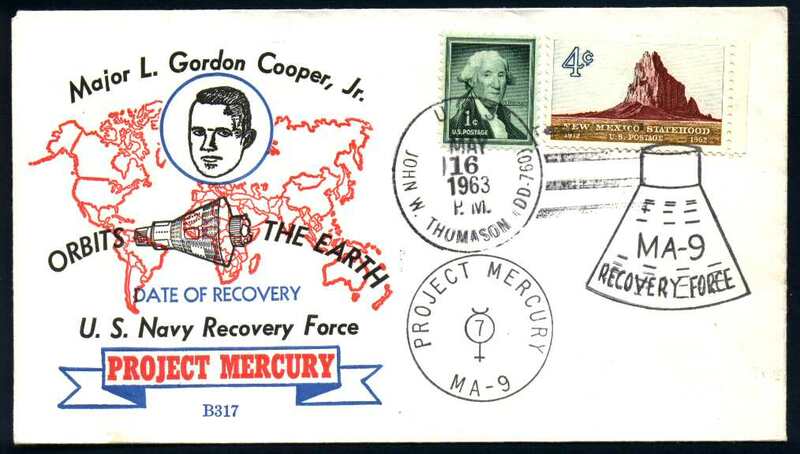 Thanks goes to Dr. Ross Smith, Steve Durst and Eddie Bizub for providing scans of this issue. The cover shown at left is a new addition to our site. Based on correspondence between collectors, we have edited our special page on the GTA-8 covers. Thanks go to Dr Ross J Smith, Steve Durst, Randy Constantin, Dennis Dillman, Ray Cartier and Tom Steiner. 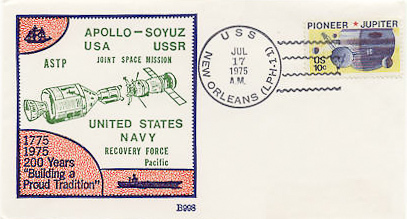 The cover shown at left is from the 1975 Apollo/Soyuz space mission. 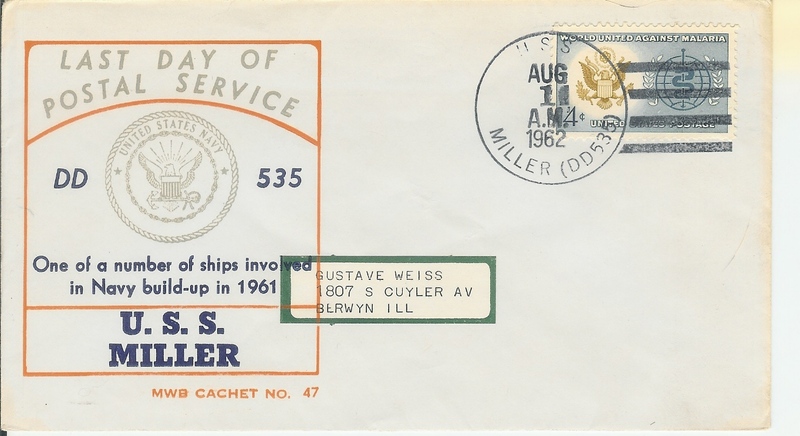 The cachet is the M W Beck designed rubber stamp and postmarked in SFO on July 24th. All that is not remarkable. 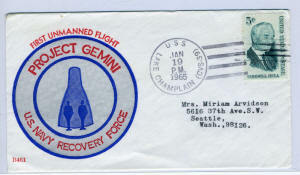 What is unique with this cover is that it was actually carried by the UDT during the recovery mission. 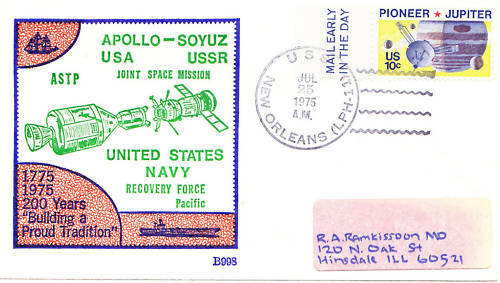 He reports that Dr Ramkissoon's name in pencil is at the bottom of the envelope but is almost completely erased. 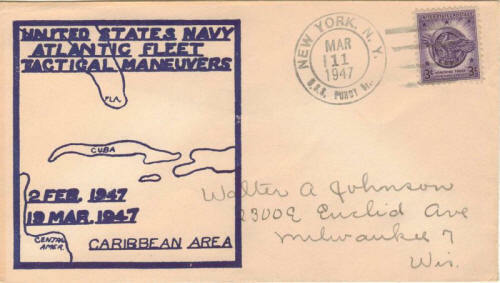 This 1947 Morris W Beck US Naval cover sold on eBay for $9.99 and was added to our site and Beck cover listings. 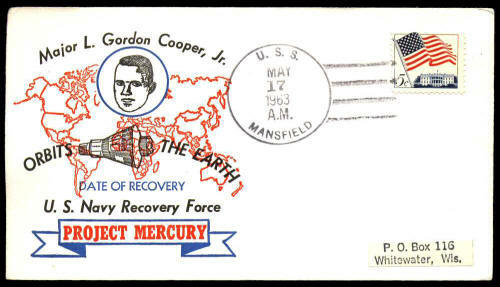 Morris W Beck's multicolored cachet number B317 for Gordon Cooper's MA-9 space flight was designated for USS Fletcher, one of the many US Navy ships of the MA-9 recovery force. Mr. Beck sent the printed (cacheted) envelopes to the US Navy to distribute to the ships that he designated. 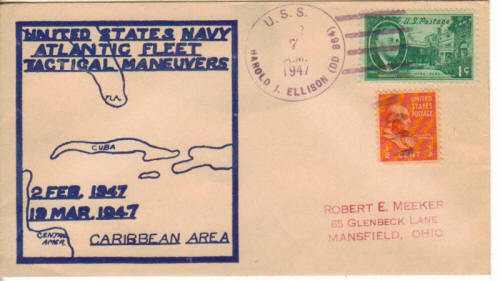 We know that when the envelopes reached the US Navy there was usually a different (non-standard) or even random distribution to the ships of the recovery force. 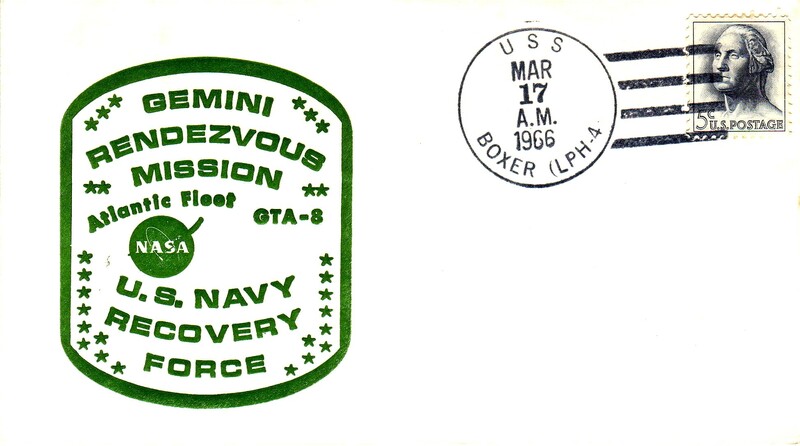 That explains why we see Beck covers postmarked on different ships for the same cachet design, B317 in this case. 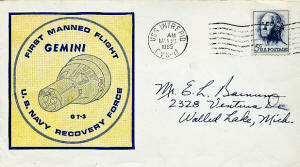 See the cover listing for more details on the story of B317 covers. 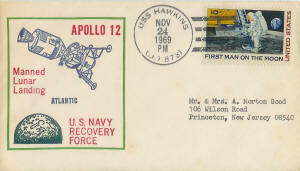 Morris W Beck printed cachet for Apollo 10, B791, without the cachet number makes it a CREW cover. This cover from the USS Ozark sold for $32.00 on eBay. 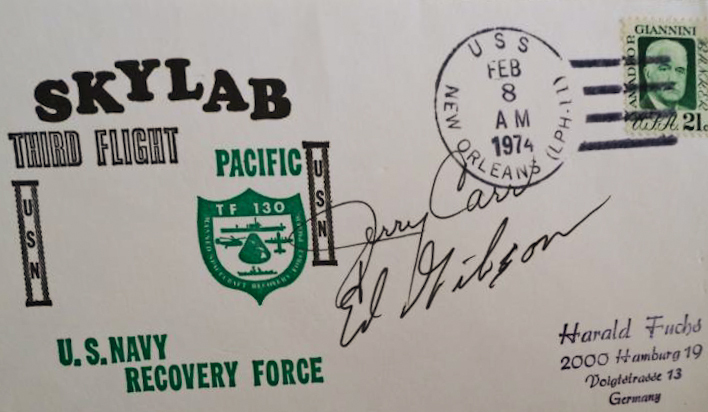 Eddie Bizub sent us this scan of B331 USS Gainard from his stock and identified it as being from the collection of the late Richard Learn. This is the only B331 from the USS Gainard we have seen with the 15 May date. 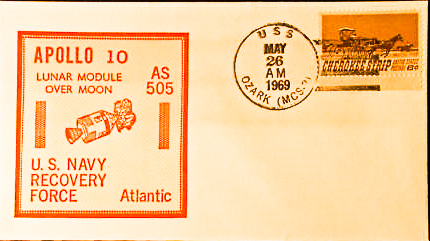 The 16 May date is the date seen most of the time. 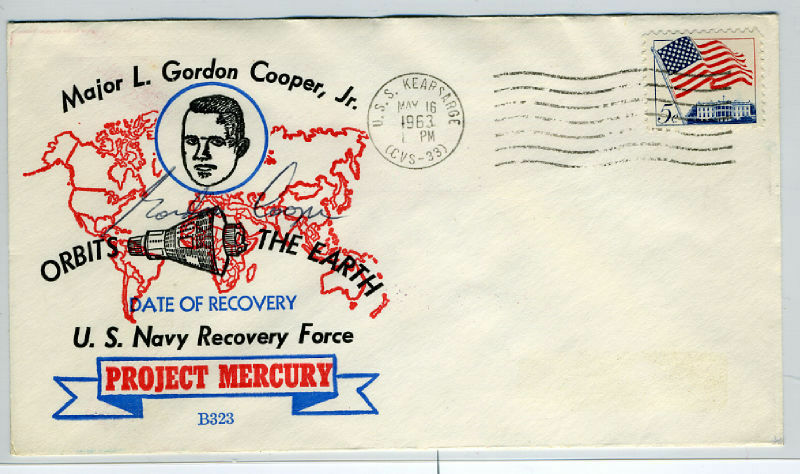 Update: This cover was sold and found a welcome home in a nice collection! 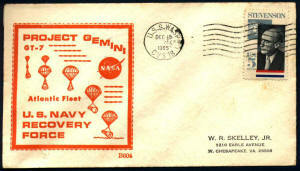 Dr. Ross Smith found this unlisted Beck cover for B604. A great find! 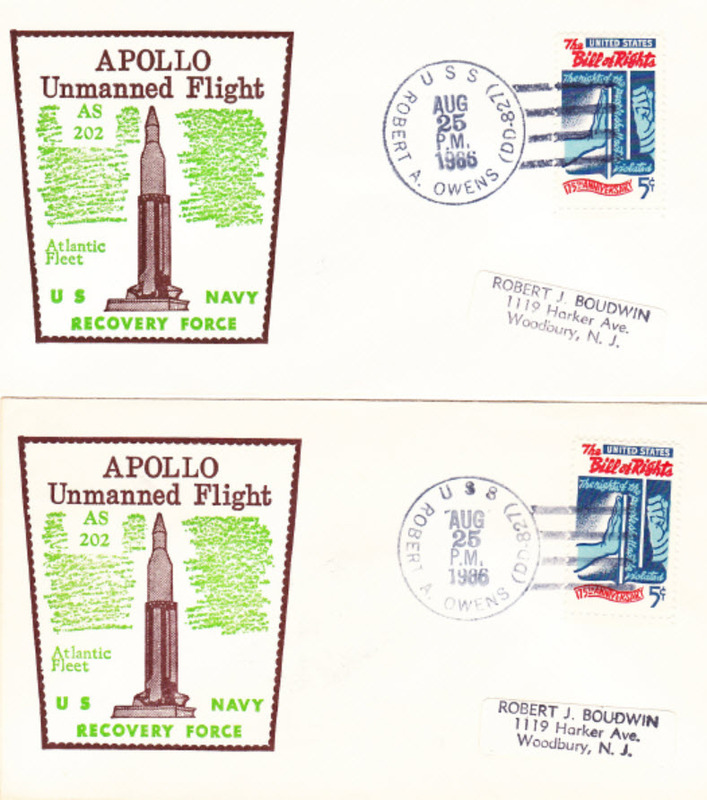 This CREW cover for the AS202 mission is already shown on this site, but what is interesting is that David Ball found these CREW covers both addressed to the well-known space cover dealer, Robert Boudwin. 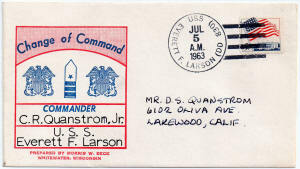 Since CREW covers are unusual to begin with, no doubt that Mr. Boudwin had connections to get two of these covers. 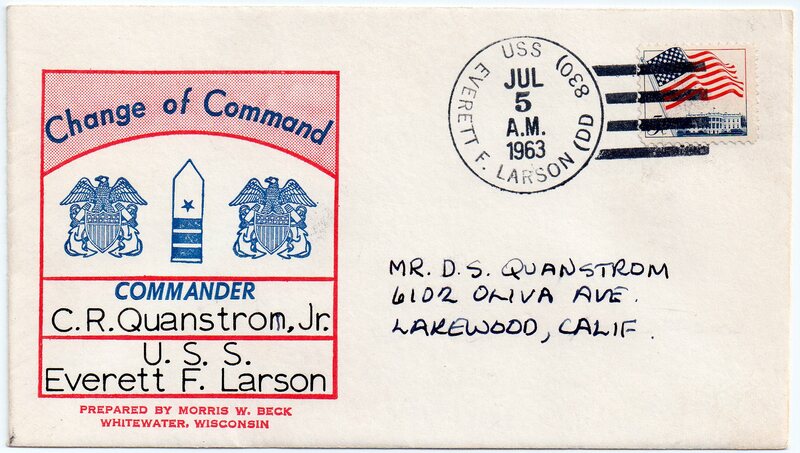 Did he get them from Mr. Beck or from the Navy? Previously unlisted. We are very happy to have this scan sent us by David Ball. This scan from CollectSpace.com Web site was brought to our attention by Dr Ross Smith. 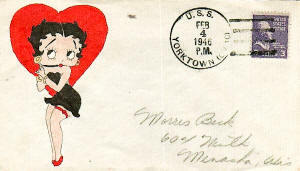 It is from the collection of Martin Schwebs Rasmussen. 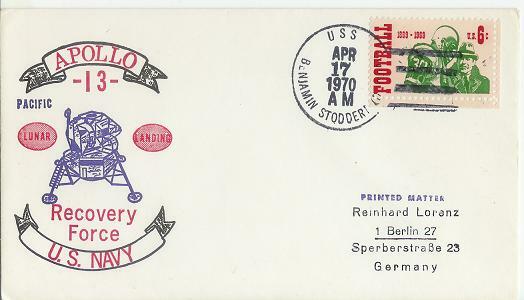 This is the only Apollo13 Beck cover seen from the Stoddert. Probably one-of-a-kind. This previously unlisted Beck CREW cover was sold on eBay in November, 2010 for $16.50. 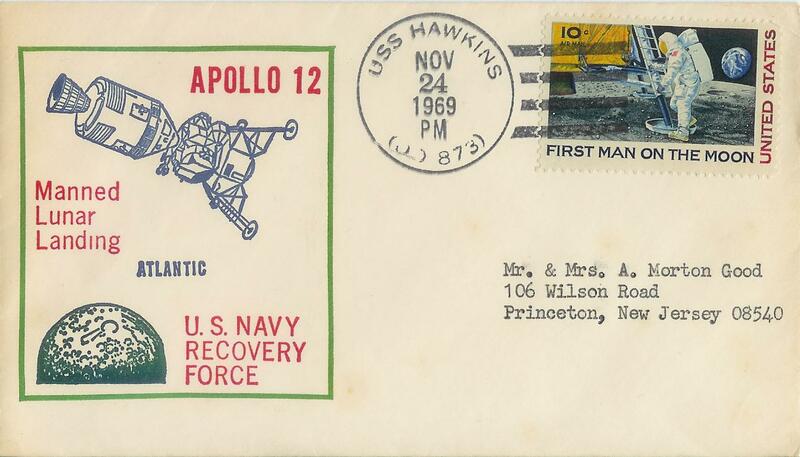 This is the only CREW cover we have seen for the Hawkins for Apollo12 and we wondered if it existed. Top: December 2010. 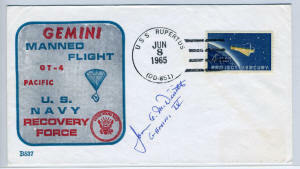 Sold on eBay. 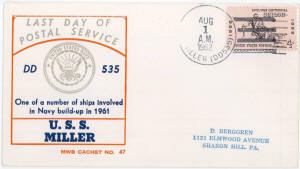 $41.00. Seller was gastampman. Center: December 2010. 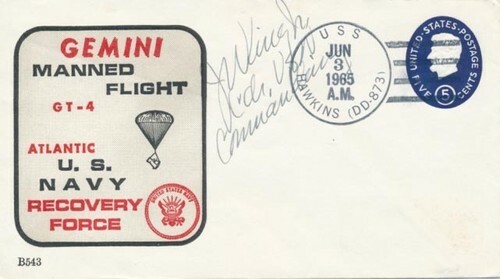 Sold on eBay. $22.37. Seller was gastampman. Bottom:December 2010. Sold on eBay. 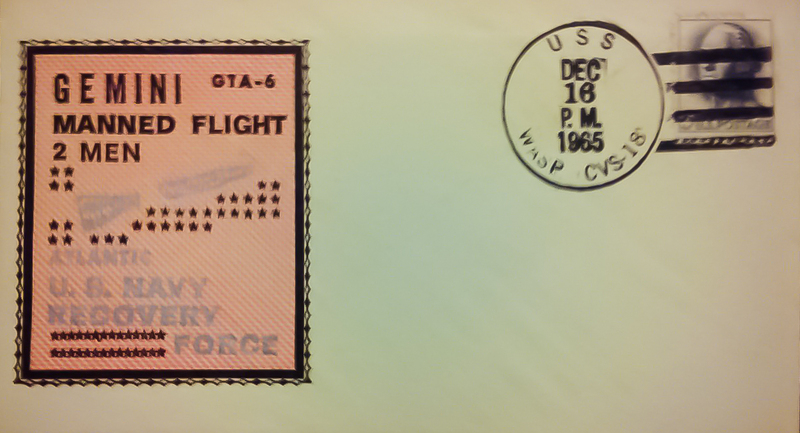 $45.64. Seller was gastampman. 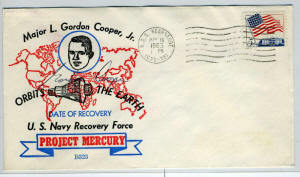 This Beck cover, cachet B323, is postmarked on the prime recovery ship for Gordon Cooper's space mission on May 16, 1963. This autographed cover sold on eBay for $103.50 after 7 bids. 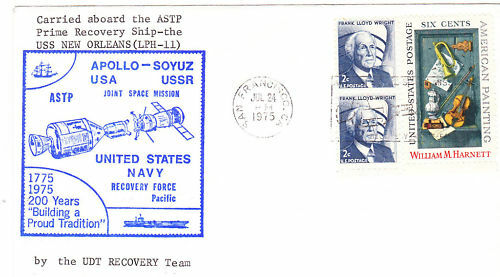 See the story of this and other ASTP covers in the listing section. 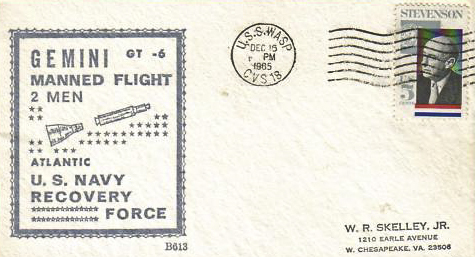 Scan courtesy of Charlie Hamilton Beck Change of Command Cover added to site. 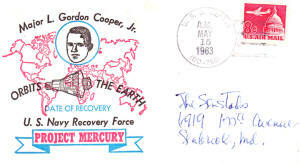 Thanks goes to Charlie Hamilton for sending us this scan of a previously unlisted cover on this Beck Cover site. Except for the covers shown below and right, all covers observed until 2010, also have a Boston MC July 31 on face of cover. 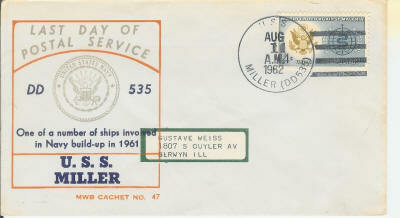 Most recent addition to the site is the USS Miller cover shown directly below. This cover shows a full and clean cancel. Most Beck 47 covers also have the Boston MA machine cancel. 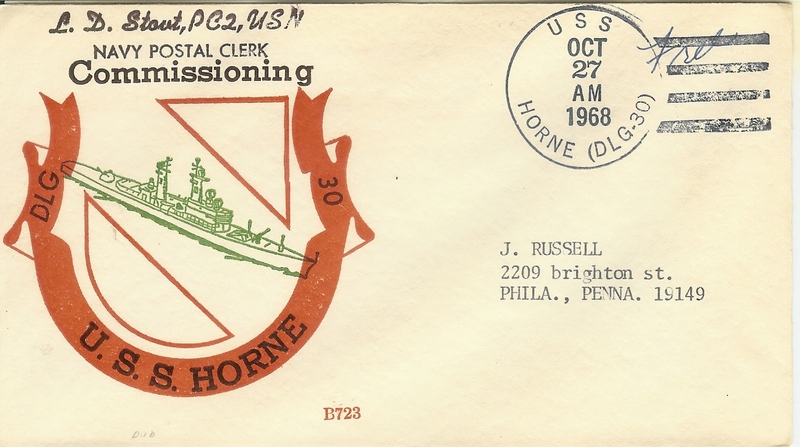 Another good example with a clear cancel plus note the cachet was printed over the address label. 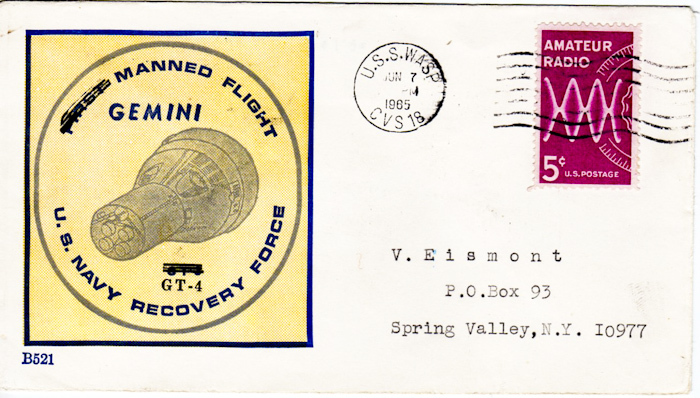 Scan courtesy of Rich Hoffner. 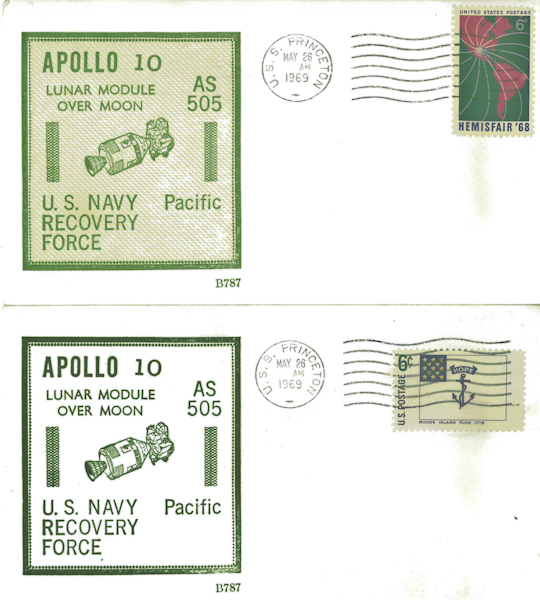 The scans at left are the front and back of ONE cover. Perhaps unique. 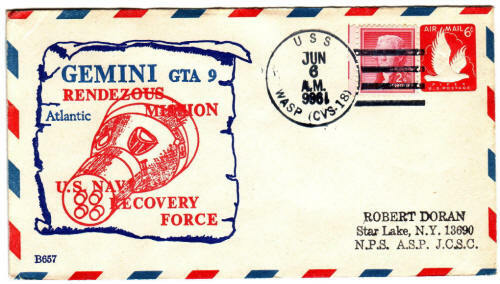 On the front is the GT-8 USS Boxer cover with the hard to find BLUE RS cachet for GT-8. 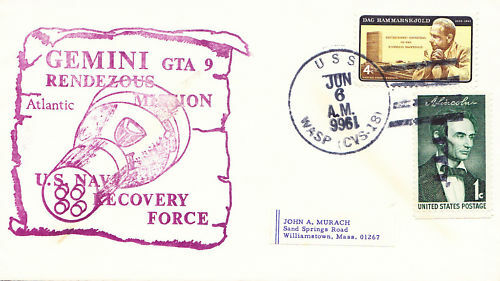 On the back of the envelope is the printed captain's cover cachet for GT-9. Two different flights, two dates. Interesting. Thanks to Dr. Ross Smith for providing information for this posting. 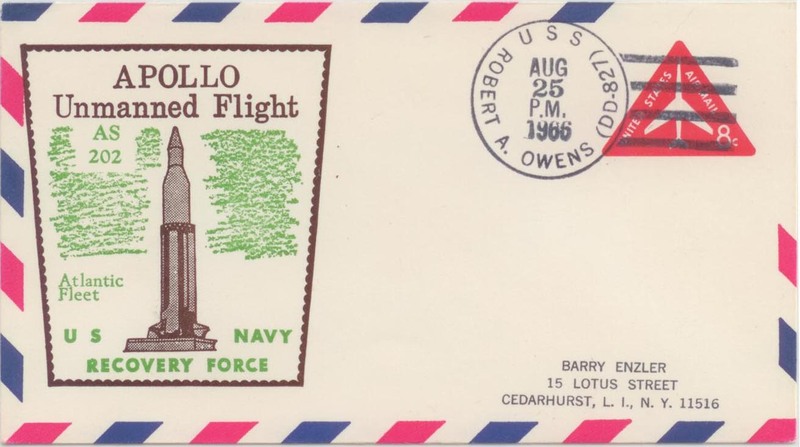 A very nice example of Beck 801 USS Hornet Apollo 11 PRS sold on eBay for $54. Beck 630 Gemini 8 PRS Sold for $255 on eBay! 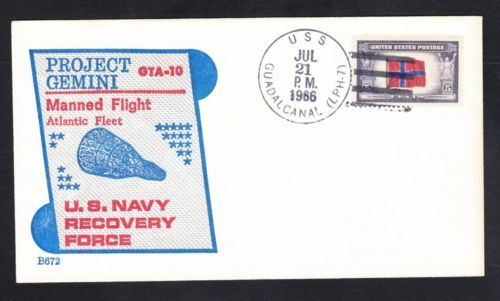 This cover, the B630, USS Mason has always been an important PRS cover and the price has varied over the years. This sale at $255 is probably a record price or perhaps the highest paid in the past 5-8 years. Rich Hoffner sent in this Beck 723 covers, a nice find in his "FREE" mail Viet Nam collection. 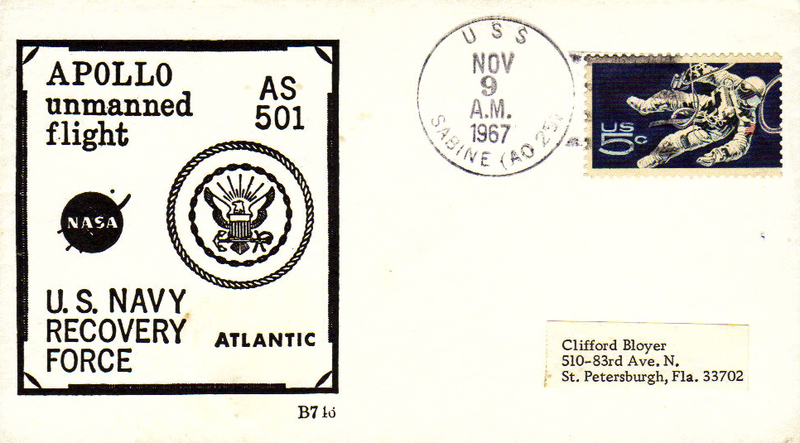 Beck # 723, postmarked while ship in Vietnamese waters with Free franking privileges. 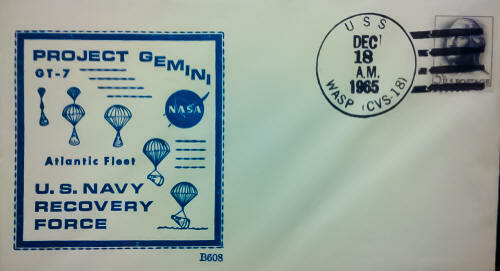 Postal Clerk applied his rubber stamp to the cover. 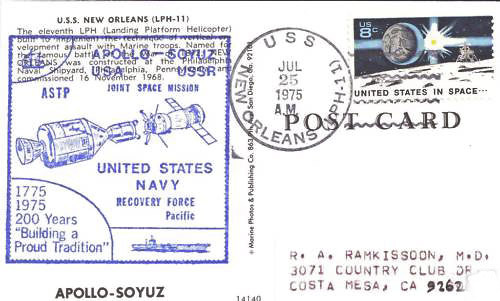 Ross Smith agrees that this cover is a Sean Marsar cover and is similar to the cover postmarked on July 15 on that same flight. 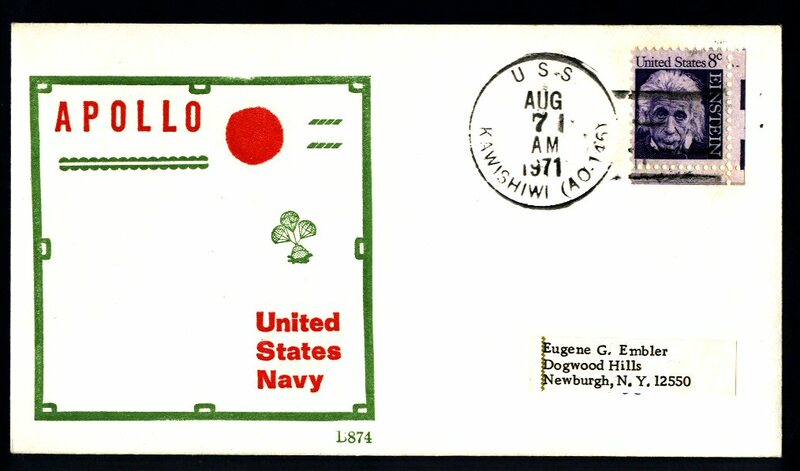 According to Dr. Smith's research, only 10 covers were postmarked for each day with an extra 20 being postmarked on July 17, the day of docking. 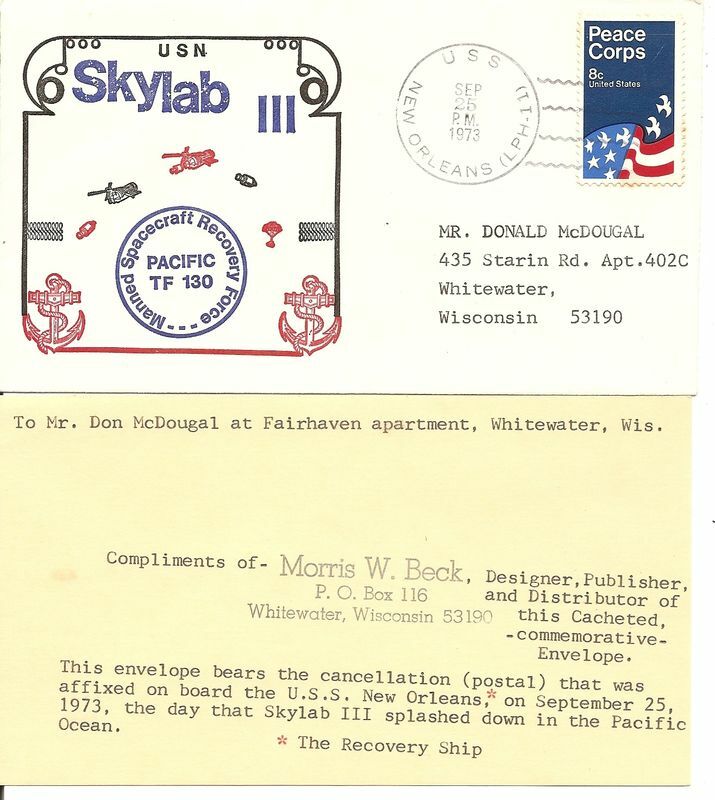 If you could assemble a complete set of the Beck and Navy RS cachets for this flight, it might be worth $1000. Beck CREW 515 GT-3 Surfaces on eBay! I'm on the road for the next 6 weeks so my additions to this site will be quick and few! The Blue envelope at left is unusual and from the exhibit of Dr. Ramkissoon. The Betty Boop cachet is from Morris Beck's personal collection. 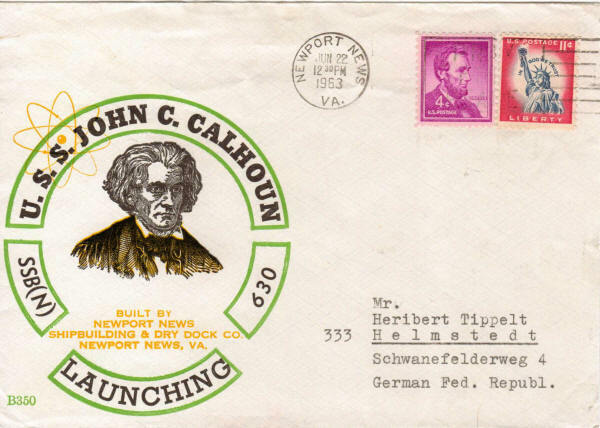 He did not produce this cachet as far as we know. 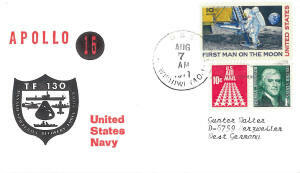 Other covers have been added in the Beck listing by individual covers. 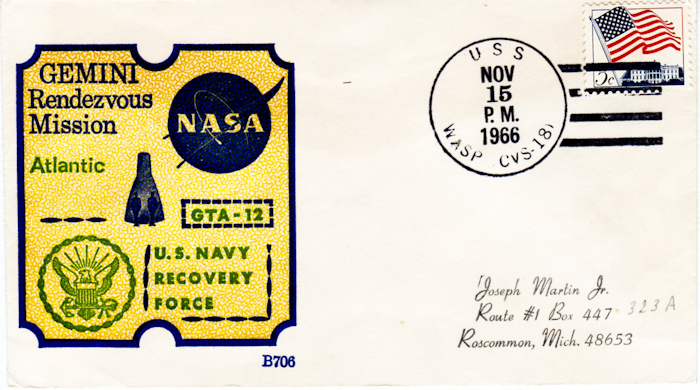 The cover below from Dr Ross Smith, with the BLACK color missing is on our site. 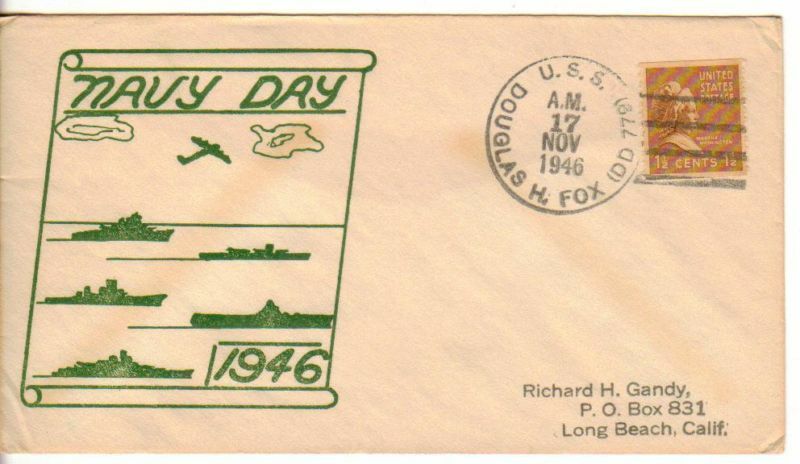 Courtesy of Tom Steiner, at left is a printed cachet color missing variety. 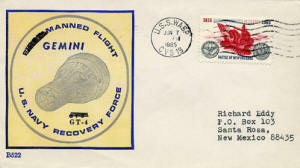 Cover at bottom left is a B874 missing the black. 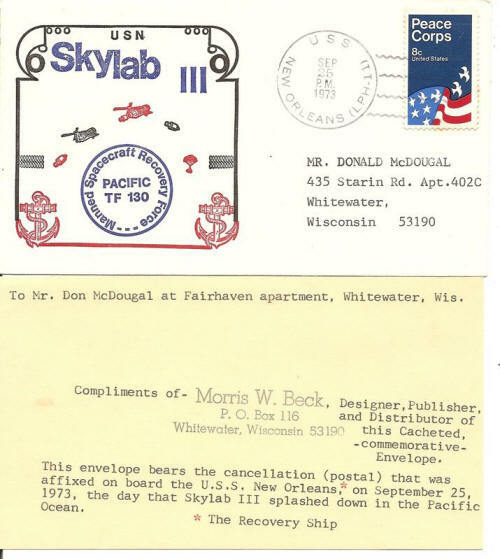 Courtesy of Greg Ciesielski and Dave Kent, here is a Beck #47 scan that made us revise the caption on the webpage. "Most cancels are poor quality. 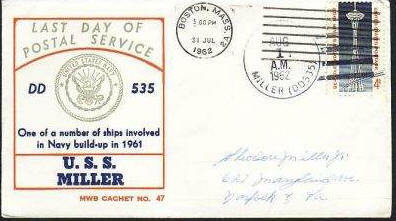 All covers observed also have Boston MC July 31 on face of cover." Bottom scan courtesy of Luc Jallot. 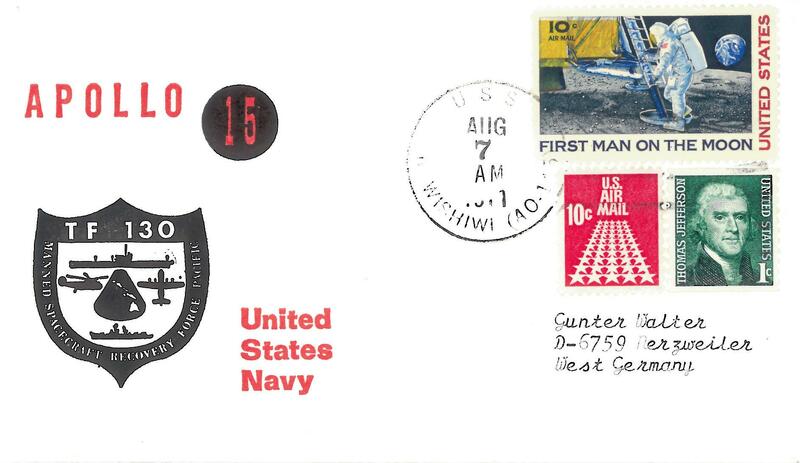 This cover is interesting because it shows the same markings as another cover on our site. 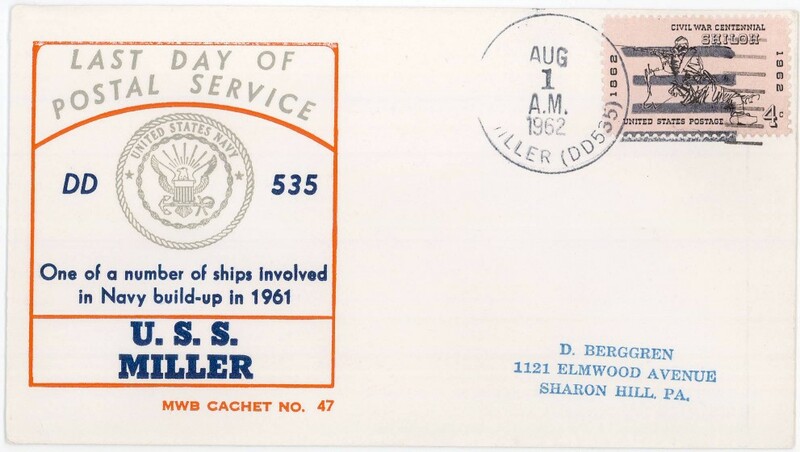 This seems to indicate that the changes to the Beck printed cachet were made by the ship's personnel and not a collector. 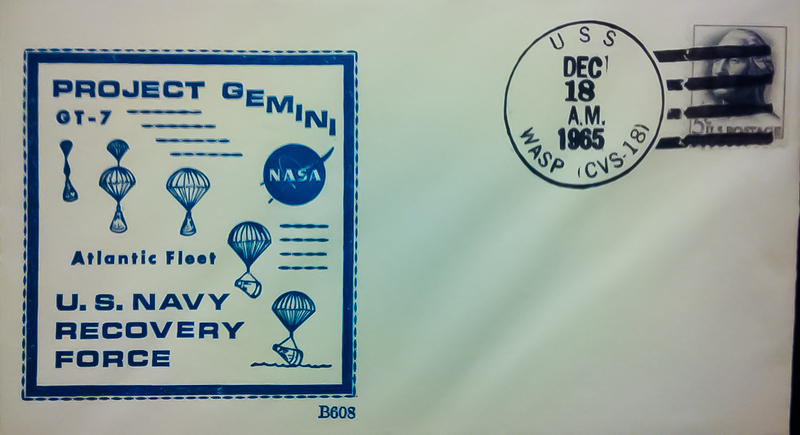 If you have a B521 OR B522 Wasp without the changes shown above, please send us a scan. 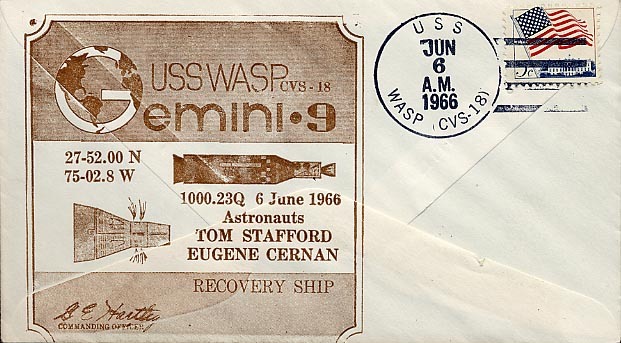 Shown here is a scan courtesy of Spaceflori of Beck 522 Wasp with the same changes as the above B521 to the cachet. Ross Smith helped to identify the interesting markings on this GT-4 cover. He wrote "the small blue circular cachet was applied by Morris Beck. 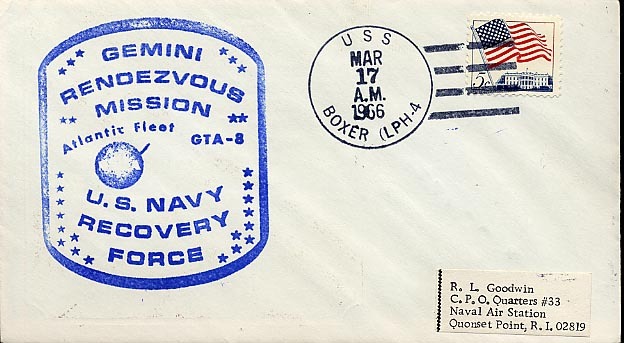 He applied it to any cover at his customers request and therefore it is not just found on recovery ship covers, but also on other covers such as launch covers. 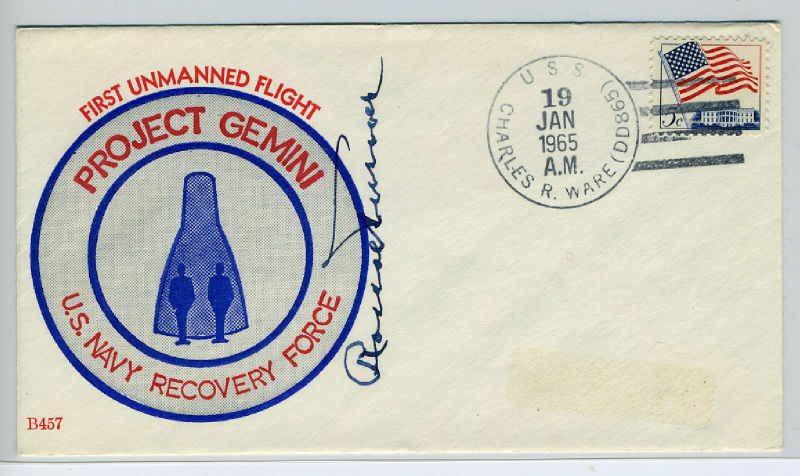 He used a number of different colored inks and I'm aware of examples from Gemini 2 to Apollo 4. 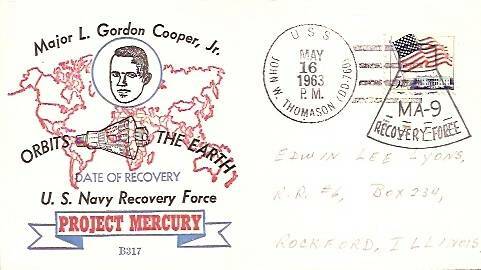 I've documented these cachets on my Recovery Ship Cover site including those ink colors that I'm aware of. 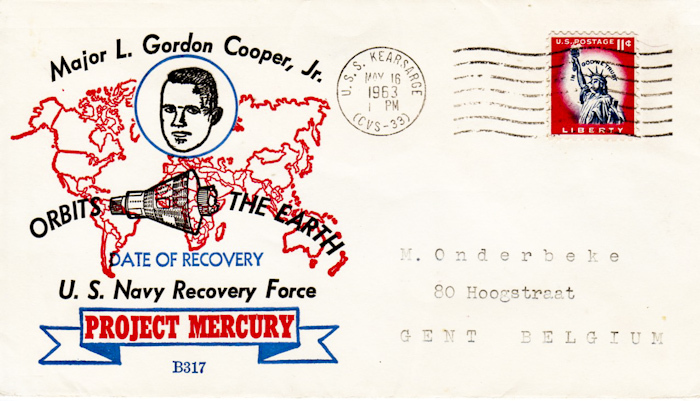 The JFK cachet is a George Goldey cachet and seems to be far less common on Recovery Ship covers than the Morris Beck cachet." Scans courtesy of Luc Jallot. Remember that the post office on the USS New Orleans was closed on the actual ASTP recovery date of July 24, 1975. 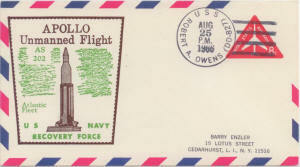 This cover is special because it is on a two-sided post card. 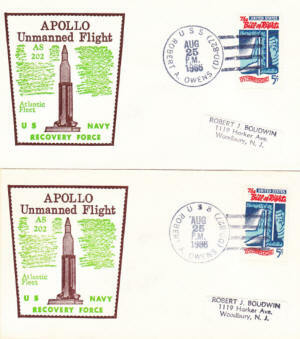 Two similar B613 Wasp covers were offered on eBay. 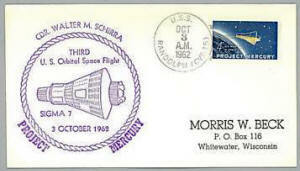 Successful bidder Dr. Ross Smith informed us of his find. 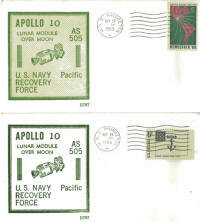 Ton Steiner sent us these scans of a missing background color on a Beck printed cover for Apollo 10. 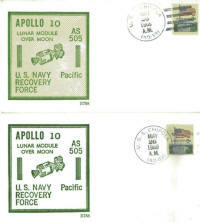 The Apollo 14 CREW cover at left was sold on eBay ($29.55). 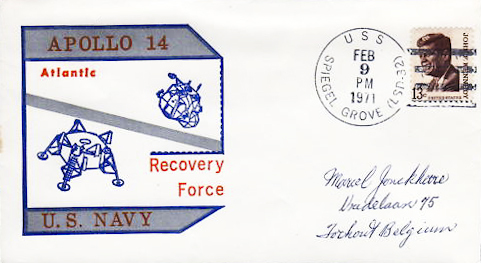 This is the first CREW cover we have seen from Apollo 14 cancelled on the Spiegel Grove, a secondary recovery ship for Apollo 14. With Dr. Smith's find, we only need tolocate the CREW cover for Apollo 14, USS Hawkins to have scans for CREW covers for all the recovery ships on that mission where Mr. Beck provided printed cachets. 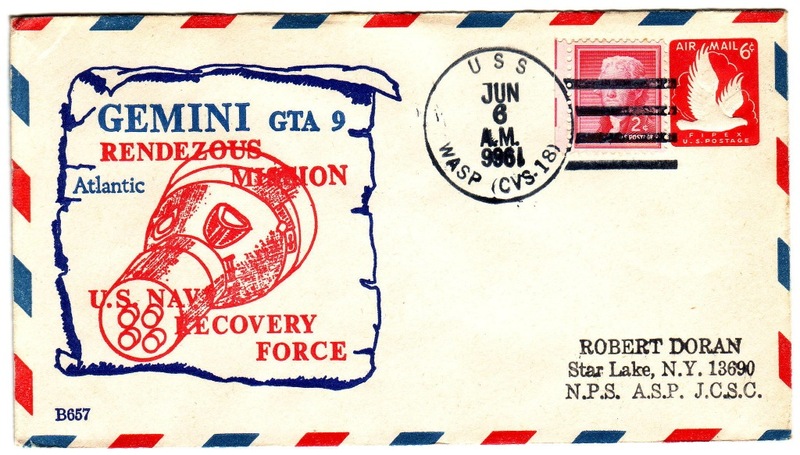 If you have a Hawkins CREW cover for this mission, please send us a scan.